As the flame glows and flickers, the pure wax candle melts away and the air fills with the timeless scent of cinnamon and cloves. 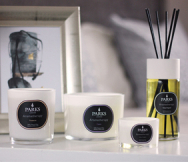 Parks London candles have held a worldwide reputation for purity and quality for over twenty years. Made with natural wax and soot-free wicks for a clean, long-lasting burn, Parks Winter Wonder scented candles are lavishly festive to bring the magic of Christmas alive in your home.